Essie “Truth or Flare” Polish – amandarobots. Not so now, especially with seasonal collections. “Truth or Flare” is from their Spring collection, but I still see it kicking around in store displays from time to time. 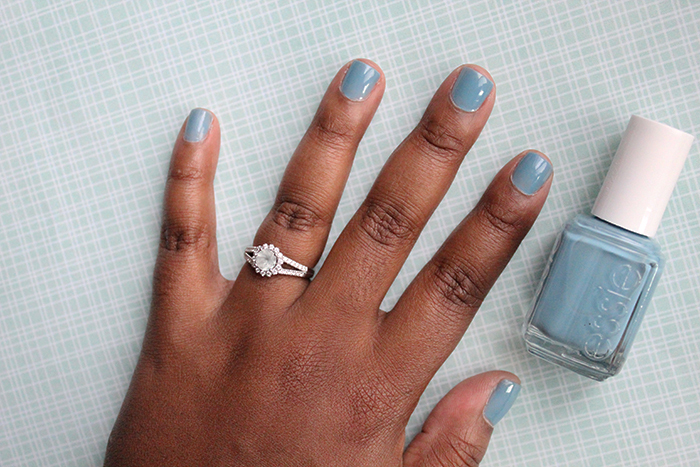 It is a truly unique shade: a murky blue with enough grey tones in there to go with just about any outfit. I’m not the biggest fan of blue polishes, but I like this one paired with a super-shiny top coat and very short, slightly rounded nails. In terms of formula, this one is really weird – the only way I can get it to be opaque is if I do a very thin first coat followed by a very (and I mean very!) thick second coat. The first coat is essentially see-through, hence the necessity of bulking up the coverage with the second. Oddly enough, the formula doesn’t get gloopy on the second coat – it’s thin enough that you can be as generous as you need to to get it opaque minus the goop. If you can find this shade, it’s truly unique and I’d certainly recommend it!